Dowsing rods are used in feng shui to locate chi energy. They can help you determine where you need to boost or change energy as well as the most auspicious location and layout when you're building a new house. While dowsing rods are a popular tool for locating and defining energy fields, master feng shui practitioners use these rods to ferret out negative energy fields in your home. Without these tools, your home might appear and even feel free of inauspicious energy. Pockets of negative energy can be found in closets, cabinets, corners and even in the middle of a room. The rods are naturally tuned to energy. These rods can even be used to locate lost objects. 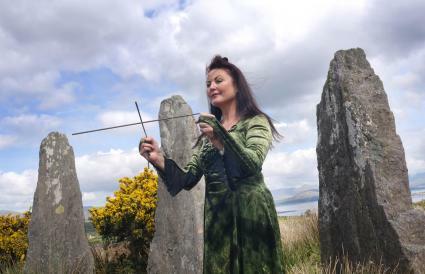 Using dowsing rods is easy when you follow specific steps. The dowser will start outside your home and move about the area to discover any negative energy areas and then move inside your home. The dowser stands in the middle of the room and holds the short L portion of the rods very loosely in his or her hands. The long ends of the rods should point outward and away from the dowser. As the dowser walks about the room, the rods will either cross over each other or move out from each other as the dowser moves. These are indications of energy fields. Whenever the rods spread out and move away from each other, its an indication that the energy field has changed. If the dowser moves over negative energy areas, the rods will separate in an outward movement. This is very similar to how negative sides of magnets repel each other. Positive energy draws the rods inward and together. An experienced feng shui practitioner maps out each area of energy change. Once the process is completed, the practitioner will offer ways to correct the negative energy in your home. A feng shui practitioner using dowsing rods will employ several methods to change and correct the energy. Brass or copper metal rods are excellent conduits between the practitioner's energy field and the negative energy. Most classical feng shui practitioners are also shamans and know how to use energy to alter negative energies in your home. Everything has an energy field surrounding it and the advent of quantum physics proves their existence. These unseen energy fields can interfere with your life. Geopathic stress pockets: These collect energy beneath the earth. Curry lines (discovered by Dr. Manfred Curry and Dr. Whitmann): Carry electrical currents in an earth grid, running diagonally, Northwest to Southeast and from Northeast to Southwest. Manmade electricity interferes with these lines and creates a negative result. Hartmann Lines (discovered by Dr.Ernst Hartmann): First to discover natural electrical lines in earth. Lines run North to South and East to West. Manmade electricity can create negative energy along these lines. Both Hartmann and Curry lines are also known as ley lines. Individuals in home: Everyone has an electrical field, if those fields of energy are not compatible, it can cause conflict and disharmony in the family. A feng shui practitioner can help you plan your home before building to ensure you utilize the best possible auspicious energies. The rods can ferret out negative and positive energies on your lot or larger properties. This ensures you won't have any hidden negative energies. For example, underground streams can create negative energy in the home by generating too much yang energy. The dowser can determine the best energy for the placement of a front door or if the area you've designated for the master bedroom is in the best energy area. Underground metal deposits can create issues if located in the east where metal destroys the governing wood element. 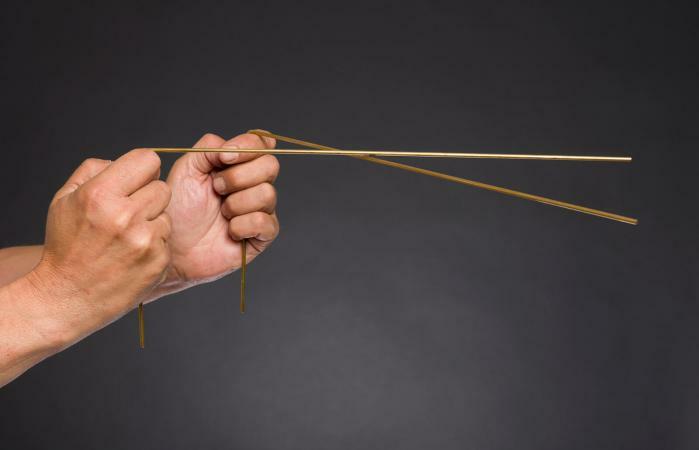 If you wish to learn how to dowse, you need to do a few things before jumping into the process. You'll want to prepare and understand what you're doing before striking out with rods in hands. The use of dowsing rods to find water dates back 8,000 years with scenes of water witches depicted on cave walls. The rods are made of a thin metal, usually brass or copper, and are L-shaped. You'll want to select a pair of rods that you feel good holding. This is a very personal choice since the energy field surrounding your body and spinning within your chakras will resonate to certain rods. Brass is a favorite choice among dowsers although copper is a close second choice. Brass silver-plated dowsing rods: 23" unfolded length rods are advertised as lost object detectors and water witching rods. Copper dowsing rods: 5" x 13" L-shape rods are advertised as lost object detectors, dowsing, water witching, and divining rods. Copper L rods: 5" x 8.5 L-shape rods are advertised for dowsing water, sensing metals, discovering energy shifts and finding lost items. You'll need to practice holding the rods. Your first reaction may be typical with the tendency to grip the rods too tightly. The level of touch is something you'll have to learn and practice. If you hold the rods too tightly, they won't move properly, if at all. You need to hold the rods tight enough to provide balance and support, but loose enough to move freely with the fluctuations of energy. When working with new clients, some feng shui practitioners often use the mirror demonstration to show clients just how accurate dowsing is. The practitioner stands in front of a mirror so clients can watch as the rods move away from each other. This is a perfect demonstration of energy fields and how powerful the element of a mirror can be for deflecting and reflecting negative energy away from the mirror or in proper uses from your home. The need to explain the importance of placing mirrors wisely and in the correct places isn't needed once you've witnessed this kind of demonstration. Dowsing rods can be used as divination tools (often referred to as divining rods) to assist a feng shui practitioner in locating and determining the kind of chi energy in your home. In addition, these rods are used to locate underground springs as well as areas known as stress pockets. Not everyone can dowse. This is because a dowser uses the rods to create a link between his or her own energy field and other energy fields. In order to achieve this connection, the dowser uses both sides of his or her brain equally. This brain balancing act is vital in order to use the rods properly and can be achieved through yoga and meditation. As you can see, you can dowse for more than water with the proper pair of dowsing rods. The feng shui application of dowsing rods can ensure you address any inauspicious energies.